Home | Blogs | Do Adults Need to Drink Milk? As children, we are encouraged to drink milk so we can “grow up big and strong.” But what happens to our desire to drink milk when we’re all grown up? 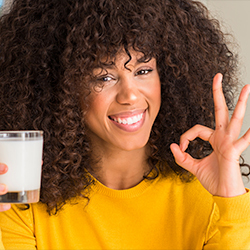 While most adults recognize the nutritional value of milk and dairy foods when it comes to calcium and bone health benefits, fewer of us make milk the mealtime choice. So, where’s the disconnect? And should we, as adults, still drink milk? Decades of research continues to point to the importance of maintaining bone health as we age in order to reduce the incidence of fractures and osteoporosis later in life. Osteoporosis is a bone-thinning disease often referred to as a “silent” condition because bone loss occurs without symptoms. Consequently, most Americans are unaware of their deteriorating bone health, and many of us don’t get enough calcium – a key nutrient for healthy bones and one of the four nutrients of public health concern. We know that calcium is especially important during times of growth, but that doesn’t mean dietary calcium isn’t important during every stage of life. In fact, throughout life, our bones are constantly changing. When your intake of calcium-rich foods is low, your body steals the calcium it needs from your bones – which can cause them to become porous and weak. The good news – people of all ages can take a few simple steps to help build and maintain strong bones and reduce the risk of osteoporosis. Bone up your diet. Milk, cheese and yogurt are some of the top sources of calcium. While other foods also provide calcium, your best bet is to choose three servings of dairy daily – plus additional non-dairy calcium sources – to meet daily calcium requirements and prevent theft of calcium from your bones. Boost calcium absorption. Vitamin D increases the body’s ability to absorb calcium. Sources of vitamin D include eggs, salmon, mushrooms, fortified milk and some yogurts. A daily dose of sunshine also provides vitamin D. For maximum absorption, distribute your calcium intake over the course of the day by including calcium-rich foods with meals and snacks. Don’t let lactose intolerance stop you. There are many lactose-free and low-lactose dairy options available. No need to forgo dairy and the bone benefits milk, cheese and yogurt provide. Get moving! Being physically active for 30 minutes or more each day can increase or preserve your bone mass and may help reduce future risk of falls. Weight-bearing activities – such as walking or running, weight training or group fitness classes – strengthen your bones. So, the answer is a resounding “yes.” We, as adults, should absolutely still drink milk – whether you enjoy it as a coffee latte in the morning or an ice-cold glass of milk on a sunny summer evening. Check out these 20 creative ways to enjoy milk or find our favorite calcium-rich dairy recipes.